It is now common knowledge that successful literacy development in children is built on a foundation of strong oral language skills. Yet while recent government reviews emphasise the importance of developing early language skills, relatively little information is available on how to build these skills effectively. Developing Language and Literacy: Effective Intervention in the Early Years bridges this important gap by presenting the details of two proven intervention programmes. The programmes were developed by the authors, a team of noted academics and specialists, to improve the phonological skills, vocabulary and grammar of young children at risk of reading difficulties. After explaining the early research that led to the intervention, the authors show how they utilised and adapted a series of intervention strategies and activities to improve the language skills of young children. The book includes a section explaining the ways and reasons for monitoring progress and tailoring specific interventions for individual children, including those with a range of additional difficulties. It concludes with a chapter devoted to their experience of training teaching assistants to deliver the programme. 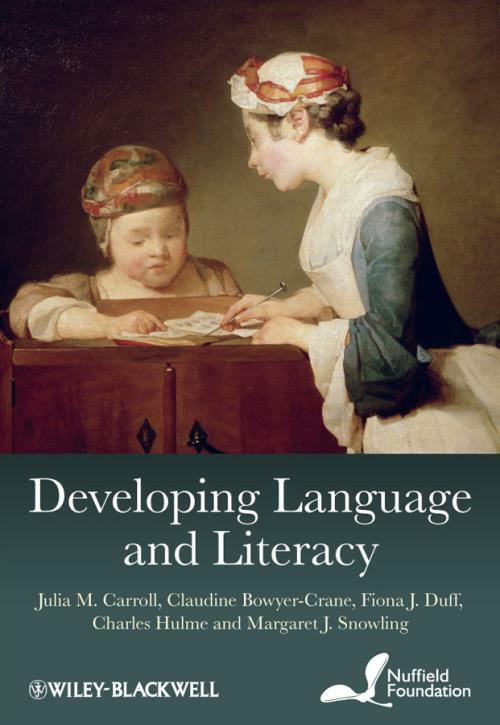 Illuminating and insightful, Developing Language and Literacy represents a valuable contribution to our knowledge about one of the most crucial stages in the development of a child. Chapter 1 Theoretical Framework: Foundations of Learning to Read. Chapter 2 The Importance of Evidence. Chapter 3 Principles of Intervention: Screening, Assessment and Monitoring Progress. Chapter 4 The Nuffield Language for Reading Study. Chapter 5 The Phonology with Reading Programme. Chapter 6 The Oral Language Programme. Chapter 7 Adapting the Programme for Children with Different Needs. Chapter 8 Programme Delivery: Training, Implementation and Feedback. Appendix 3.1 Reference List for Assessment Tests. Appendix 5.1 List of Books Used for Group Work. Appendix 6.1 Example Sessions from the OL Programme. Appendix 6.2 Nursery Rhyme Time. Appendix 6.3 Resources Used to Develop the Programme. Appendix 8.1 The P+R Programme Manual. Appendix 8.2 The OL Programme Manual. Appendix 8.3 Handout for Describing Segmenting and Blending. Appendix 8.4 Examples of Inconsistent Letter–Sound Correspondences. Appendix 8.5 Handout to Support Individual Book Reading. Appendix 8.6 Individual Book Reading Strategies. Appendix 8.7 Guidelines for Developing Sight Word Reading. Appendix 8.8 Handout on Speech Production. Appendix 8.9 Example of a Narrative Task.